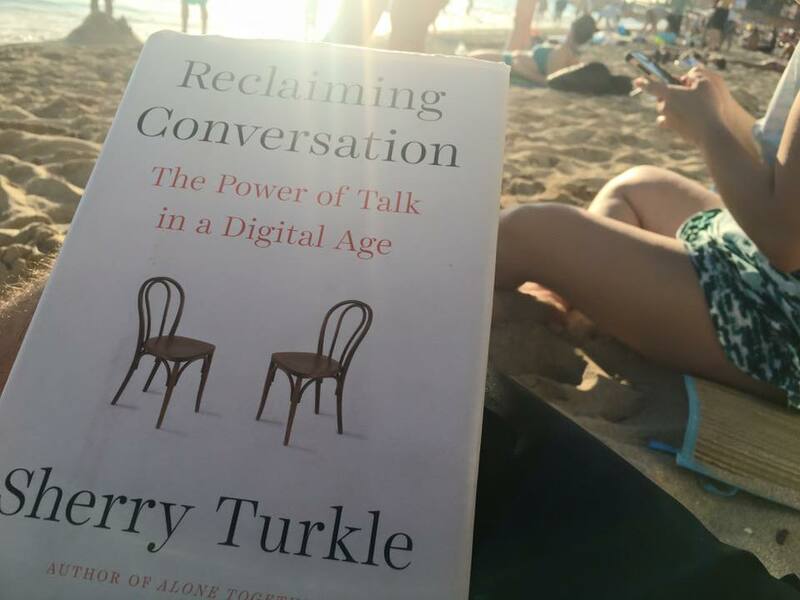 Reclaiming Conversation: The Power of Talk in a Digital Age by Sherry Turkle. Terkel has been one of the main researchers for years on the impact of technology and social media on modern American relationships. Until this book she has been hugely optimistic, but now after research questions the authenticity and veracity of our use of technology. She writes that technology makes us forget what we know about life. Laptops and smart phones are not things to remove from our lives. They are facts of life, part of a creative lives. The goal is to use them with the greater intention. We have to reclaim our attention, from multitasking, Facebook, solving problems with apps. We need to reclaim our attention for solitude, friendship, for society. We seem to have moved from being in community to having a sense of community. Face-to-face conversations can never be replaced by tweets texts, or apps. Boredom is not a negative thing. We need to stop fleeing boring moments, which are part of life, by going straight to our smart phones, to see what others are doing via Facebook, Twitter, Snapchat or Tinder. In boredom we tap into creativity as our mind wanders. it’s in solitude, which is different than loneliness, that we discover who we are as individuals. Then, and only then, can we be individuals with others in community. She concludes: now we have to ask if we become a more human than we give our most human jobs away. It is a moment to reconsider that. It is not a moment to reject technology but to find ourselves. This is our nick of time to acknowledge the unintended consequences of technologies to which we are vulnerable, to respect the resilience that has always been ours. We have time to make the corrections. And to remember who we are, creatures of history, of deep psychology, of complex relationships. The book is long, deep – the very thing we most often flee and avoid by turning to our smartphones. But if you’re game to slog through it, you’ll be rewarded with new, deep, thinking and creative reflections in our world. As a pastor the book reminds me that I too gotten give myself over to the multitasking “efficiency” believed possible with technology. But as a pastor, face-to-face conversations are the main part of my job. Listening to others. Listening to the text. Listening to the community. It’s too easy to avoid conversations, or uncomfortable moments by sending an email instead of visiting in person. That relational connection, risk taking of conversation and face to face collaboration might just be what the Church has to offer our 21st century world- if we can get beyond ourselves and our technology distractions.